ReinventionWorks was conceived when my guest, Hollis Thomases, had to serve jury duty. Yep. In the midst of her own reinvention, and unable to bring any electronic devices to the jury room, she began contemplating her next career move. After listing a few ideas she had a flash of inspiration: To capture the stories of individuals going through their own reinvention and turn it into something special. Hollis had built up quite a list of credentials over the years, so why not use her talents as a connector, networker, and storyteller to inspire, teach, and spark reinvention in others? This kind of sums up her baby, ReinventionWorks. And today’s podcast is all about Hollis, her story, and what she is doing to make her own dent in the universe. We start off talking about young Hollis, what it was like growing up in Rockland County New York, and then talk about her years at Cornell University. Next, we get into how she got started in the social media world, and how her first reinvention happened while she was working as a communications assistant for the greater Baltimore Board of Realtors. Hollis spent the next 10 years of her career in various jobs in marketing, PR, sales, etc. So we talk through her foray into the digital marketing world, and how a great idea she thought she had, actually led to her pivoting and reinventing her entire business. 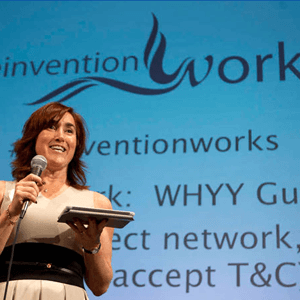 Fast forward to what she is doing now—ReinventionWorks. Hollis and I discuss how she came up with the idea, what the platform and program is all about, and the amazing importance of thinking as a “reinventionist”, no matter your age or situation. How do you define reinvention? How does someone go beyond mere change? Can someone reinvent themselves working for someone else? What habits keep you on track? What are some of the questions you ask someone wanting to reinvent themselves? Everything about her reinvention experiment. Reinvention reaches many different age groups. The average life expectancy of a company on the NY stock exchange is 10 years. The importance of intention with reinvention. Internal chatter is the little devil and it’s usually what stops you from change.